Great evergreen groundcovers that provide flowers and interesting fruits are an advantage in any garden. Amongst the best are some of the nearly 180 species of Gaultheria (Gahl-THE-reeah). Their evergreen, alternate leaves distinguish them, as do their sometimes-scented, urn-shaped flowers and their edible berry-like fruits (technically, the swollen calyx), which are attractive to birds as well as humans. Many species have striking red stems that add color through the winter. 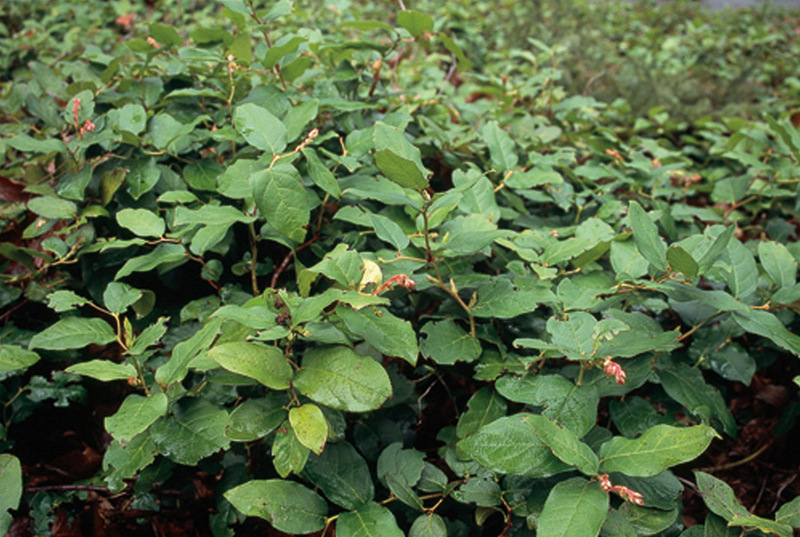 With their diversity of growing conditions, this genus adapts easily to gardens, particularly those in the Pacific Northwest where one species, G. shallon, is a familiar shrub in the native woodland understory. The genus was named in 1735 by Carl Linnaeus to honor Dr Gaulthier, a physician in Quebec City. Members of the rhododendron family (Ericaceae), gautherias are native to eastern and southern Asia, North and South America, and Australasia. Lewis and Clark described them during their 1804-1806 expedition, and Ernest “Chinese” Wilson collected many during his plant explorations in China. Gaultherias need moist, well-drained, acidic soil to prosper. They can be propagated by seed after cold stratification, by half-ripe shoots started in sandy flats, or by division. If propagated by seed, mature seeds should be collected in late summer or early fall. The seeds need light for germination, and they may take several weeks to sprout. Most plants will take nearly three years to bear their first flowers or fruits. 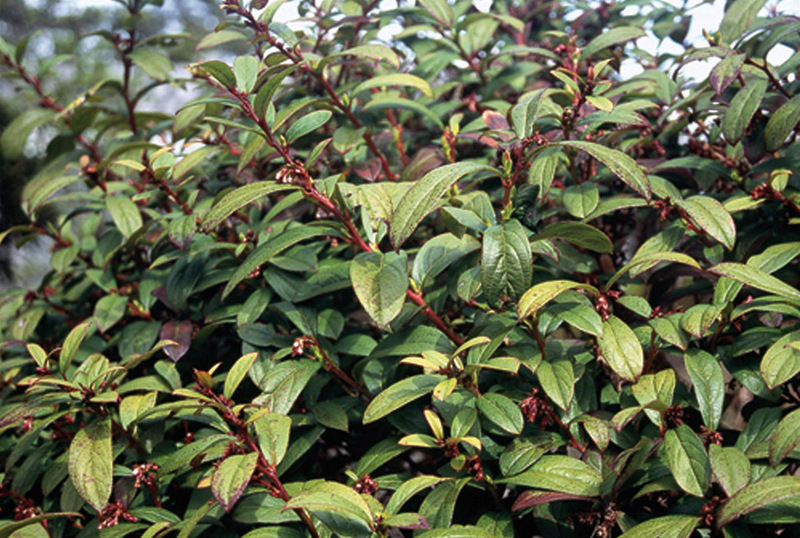 Although an infrequent occurrence, Gaultheria can be severely devastated by anthracnose. Several groundcover species are available. Gaultheria nummularioides can have its ovate leaves touched with red, veined, or plain green and can be furry with indumentum. It rarely reaches more than ten inches high and is hardy in USDA zones 7 through 9. The solitary white, pink, or crimson flowers are followed by dark blue purple or black fruits. 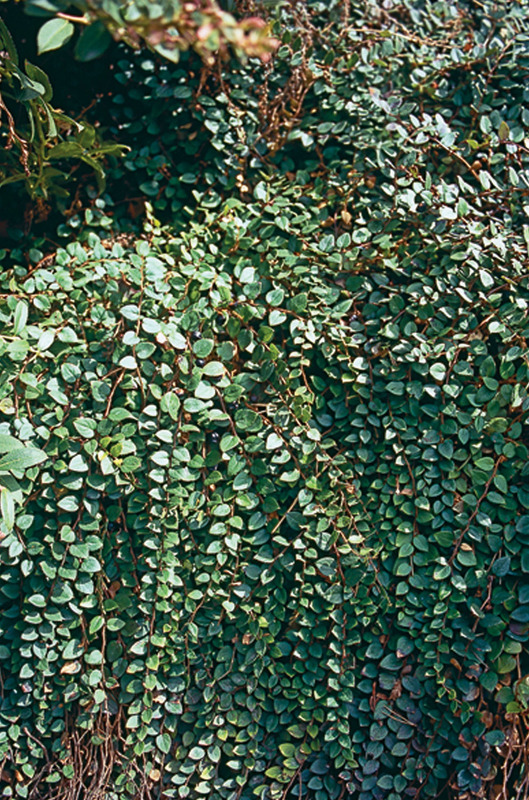 Hailing from China, Indonesia, and India, it grows in evergreen forests, often draping over rocks or covering cliffs. Smaller still in leaf, flower, and fruit is G. nummularioides var. minor. This ground-hugging trailer works well under azaleas and other acid-loving small shrubs. Native to eastern North America and commonly called wintergreen, Gaultheria procumbens spreads by underground stolons to form a three- to six-inch groundcover with glossy, two-inch, oval leaves and white flowers in summer. 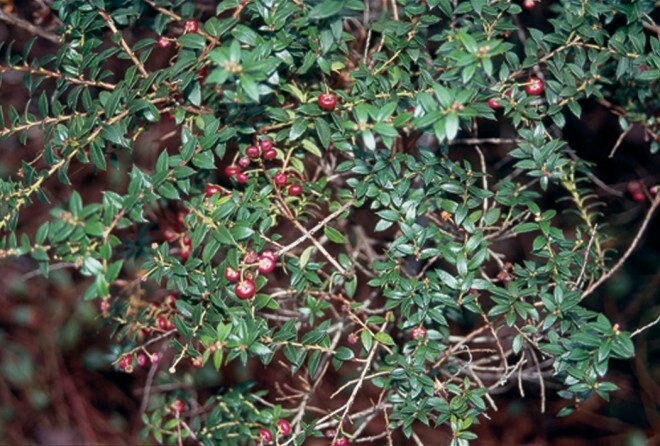 In the fall, edible pinkish red berries have the characteristic wintergreen flavor but a somewhat mealy texture. 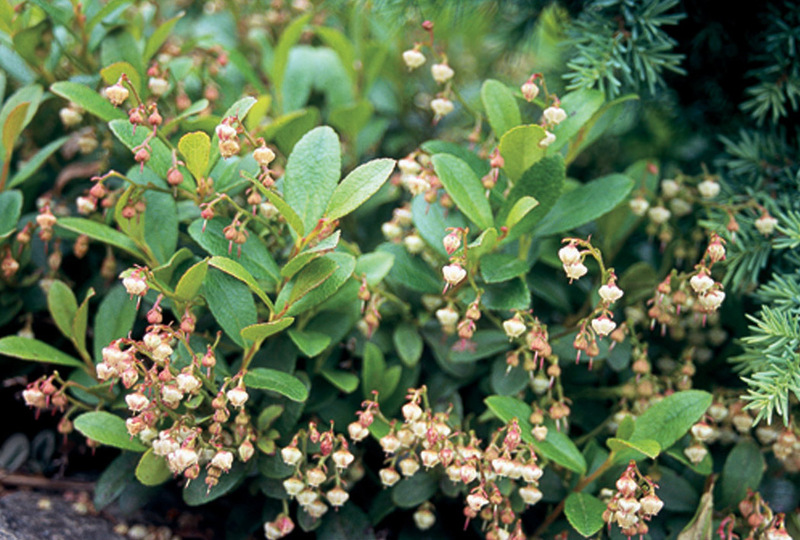 It is among the hardiest of the Gaultheria, tolerant of USDA zones 4 through 9 (Sunset zones 1-7, 14-17), and does well in bright shade. 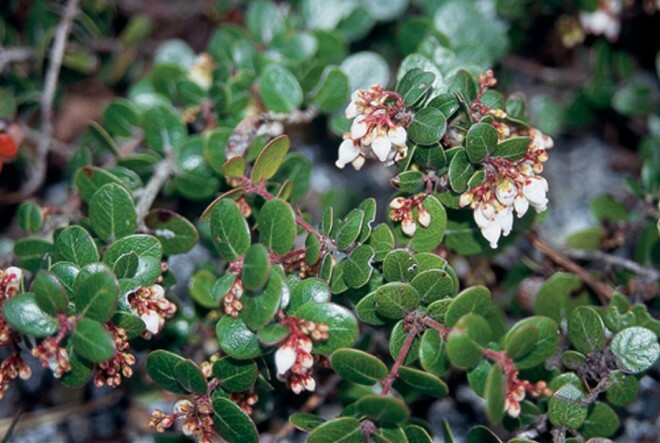 Classified until 1991 as Gaultheria pyroloides, G. pyrolifolia is a creeping, semi-erect shrub with white (rarely pink) scented flowers in June. The dark purple fruit ripens in late summer to early fall and is edible, though lacking in flavor. From the Himalayan Mountains, it naturally grows on windswept alpine moorlands, grasslands, and in small thickets and is reliably hardy in USDA zones 6 through 10. Gaultheria cuneatais a charming foot-tall groundcover, with reddish stems that offset the narrow ovate leaves. Small scented white flowers in late spring precede white summer fruits. This plant needs perfect drainage. Originating in western China, it is hardy in USDA zones 7 through 9 and grows in sun or part shade. Nine to twelve inches high, Gaultheria miqueliana makes a low groundcover in full to part shade. Native to Japan, East Asia, and Alaska, it is hardy in USDA zones 5 through 8. The white scented flowers are followed by sweet and spicy, pink or white fruits. Not all Gaultheria species are short. Among the best-known is salal (G. shallon), a native woodland plant in much of the Pacific North-west and coastal California. Usually about three to four feet tall, it will be reduced to less than two feet by full sun and poor soil, while reaching up to ten feet in shade and good soil. The round, glossy green leaves are highlighted by white to pink urn-like flowers in spring and edible but bland fruits in late summer. Hardy in USDA zones 7 through 10 (Sunset zones 4-7, 14- 17), salal combines beautifully with woodland plants and can be especially effective with the taller selections of rhododendron and camellia. te, frequently fragrant flowers are succeeded by clusters of blue purple fruits. This Chinese native grows from a foot tall in full sun to five feet tall in ideal conditions of loamy soil and semi-shade; it spreads by runners and is hardy in USDA zones 8 through 10. Discovered in 1940, Gautheria semi-infera is native to mountainside thickets in the eastern Himalayas, North Burma and western China. Purple blue fruits follow the white flowers. It reaches about three feet and does well in sun or part shade. Prickly leaves set off Gaultheria mucronata, classified until 1990 as Pernettya mucronata and still to be found in nurseries under that name. 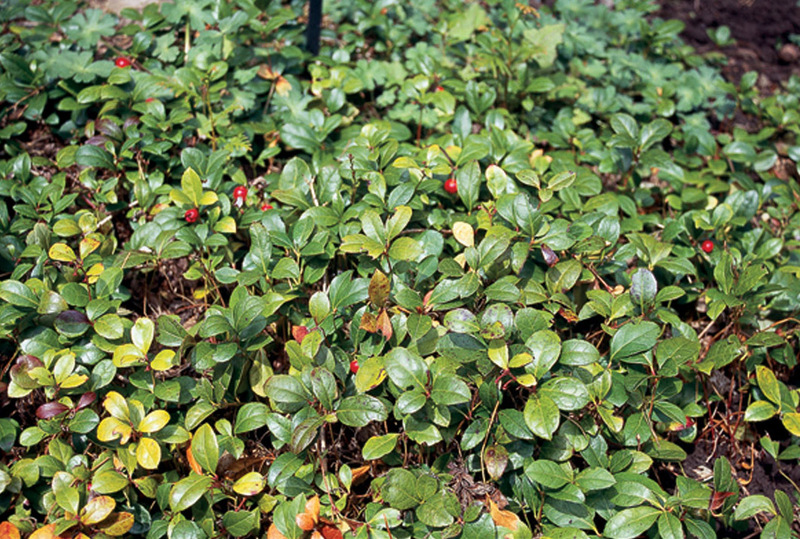 The typical white flowers cover the bush in spring and sometimes again in fall; rosy red berries remain throughout the winter. Native to the Andes of Chile and Argentina, it is hardy in USDA zones 7 through 9 (Sunset zones 4-7, 15- 17) and is tolerant of bright shade. It grows to about three and a half feet and spreads by underground runners. Both salal and Gaultheria mucronata are common in the gardens of southern Great Britain, where they have hybridized to produce G. x wisleyensis, a three foot by three foot evergreen shrub. Hardy in USDA zones 6 through 8, it takes full to semi-shade but must have moist, light, loamy soil. The blue black fruits are edible, either raw or cooked, but do not offer much flavor. This plant spreads by suckers and must be propagated from cuttings or offshoots, since the hybrid does not produce viable seed. Thriving under the same growing conditions, Gaultheria make wonderful companion plants for rhododendrons or azaleas. The ground covers do well in woodland settings, whereas individual specimen plants of the taller types accent the semi-shaded portions of the perennial or mixed border, adding winter interest with their evergreen leaves. The smallest types can be attractive in rockeries and containers, especially combined with dwarf conifers. Gaultheria are eminently suited for West Coast growing conditions. Members are critical to our continuing and future programs. Receive discounted pricing on tours and events, plus printed versions of our publications.